Today, both healthcare providers and patients face a number of challenges. The population is aging and chronic illnesses are on the rise. Healthcare costs are going up and the number of primary care providers and specialists is not growing quickly enough to meet demand. These factors and others put a strain on the system that isn’t good for anyone. That’s why the growing adoption of telemedicine technology is so important. It has the power to save patients time and money and simplify the delivery of certain services for providers. With telemedicine technology, everyone wins. The term “health information technology” (health IT) is a broad category of solutions that includes technologies to store, share, and analyze health information. Telemedicine technology is a subset of health IT that refers specifically to remote clinical services. They say that necessity is the mother of invention, that’s why it makes a lot of sense that modern telemedicine began in the early 1960’s when NASA first put men in space. The wellbeing of the astronauts was measured with technology onboard the spacecraft and inside the space suits. The results were transmitted to monitoring physicians using satellite technology. Eventually, NASA turned their attention earthward and started a project to deliver healthcare to the Papago Indian Reservation in Arizona. A van with a variety of medical instruments was sent to the isolated population. Two paramedics used the equipment, including an x-ray machine and electrocardiograph, and transmitted the results to specialist via microwave transmission. For many years, telemedicine technology was used to connect patients at rural healthcare facilities to specialists in more populated urban centers. Of course, today, the use and delivery of telemedicine is much simpler. The widespread use of the internet and video technology eliminate the need for costly special equipment. Like everything else, there’s an app for that. Most medical practices already electronic health records (EHR) and/or patient management technology. Chiron Health believes that it is important that telemedicine technology integrate seamlessly with these core solutions. 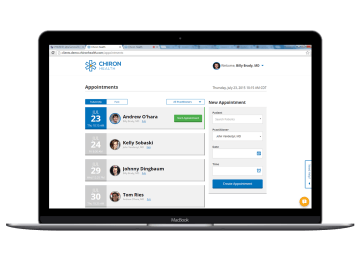 Providers are able to schedule a “Chiron Telemedicine” appointment using their normal scheduling system.We integrate with many of the most popular solutions. The use of telemedicine technology allows patients to receive follow up care and chronic illness management from their own home on the devices that they already own and use. This is especially important for those who are homebound or have difficulty arranging travel. For healthier patients, it reduces travel time and costs and requires less time away from work. As an added benefit, patients are not unnecessarily exposed to other, potentially contagious patients. In short, telemedicine removes many of the barriers that prevent people from actively managing their health. Telemedicine technology is great for providers as well. Its use can help extend clinical services to reach more patients efficiently and profitably. It helps improve health outcomes by increasing patient compliance with follow up and chronic illness management. This strengthens patient relationships without putting additional strain on the office. The best telemedicine vendors understand the challenging landscape of regulatory compliance and reimbursement and design solutions to help providers navigate it. Providers considering adding telemedicine services are right to be concerned about general security and HIPAA compliance in any solution they consider. Consumer video calling apps like Skype or FaceTime, for example, are insecure and non-compliant and should never be used for patient appointments. 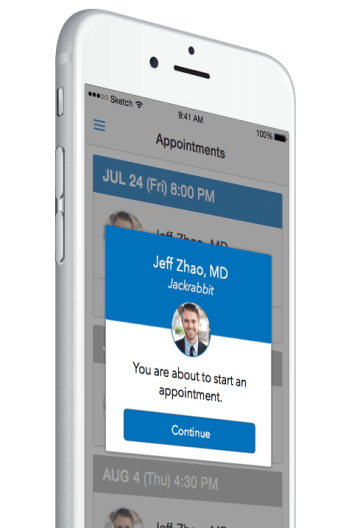 Purpose built telemedicine technology, like what we offer at Chiron, is designed to provide HIPAA compliant real-time, video visits with security that patients can rely on. Technology can’t solve every problem, but it can certainly make a dent in a few. Telemedicine technology can help ease the strain on our limited healthcare resources and make healthcare management more convenient and less costly for consumers. If you’d like to know more about how it might be put to work for your practice, just let us know.